At Rosh Hashanah, the Jewish New Year, apples are dipped into honey to represent the hope for sweetness in the coming year. These crostini combine that traditional pairing as an appetizer. 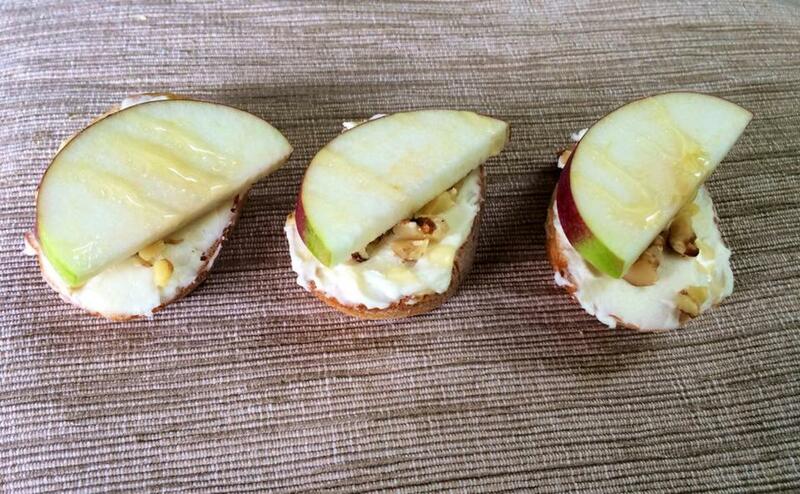 Spread goat cheese mixed with honey onto toasted baguette slices and top with chopped walnuts and apples. Later in the season, use the toasts to accompany a warming squash soup. 1. Set the oven at 350 degrees. 2. Set the bread in one layer on a rimmed baking sheet. Spread the nuts in a baking dish. Toast both for 8 to 10 minutes or until lightly browned. Chop the walnuts. 3. In a food processor combine honey, goat cheese, and a pinch salt. Pulse until the mixture is smooth. Spread the goat cheese mixture on the toasts. Sprinkle with walnuts, top with apples, and drizzle with honey.